Magnificent Log Home sitting on over 20 acres just behind County Park South in Cape. The main level features massive log walls in almost every room and impressive hand hewn log stairways. The great room features a massive stone fireplace and large windows on either side offering a tree top view. Large welcoming eat-in Kitchen with corner fireplace. New stainless appliances and new quartz countertop. The loft features a nice guest suite with open play areas and lots of storage nooks. Don't miss the secret hideaway or the log ladder hidden below the secret escape hatch! The third fireplace is the focal point of the lower level and is wood-burning with an insert. There is an open kitchen and family room with large wrap around counter that makes another great place for entertaining or could be used as a mother-in-law suite. Don't miss the 3/4 bath with the tile and stone shower that leads to the 3rd bay of the garage. There is another room plumbed for a bath on this level. Stunning marble entry foyer with custom built suspended stairway. Very open floor plan (no hallways). Designer ceilings-cherry wood office with fireplace. Lovely master suite on main level. Porte cache with electronic gate. 3 car garage. Beautiful private backyard. Sun room 21x25 is AWESOME!! This home is one owner and custom built. 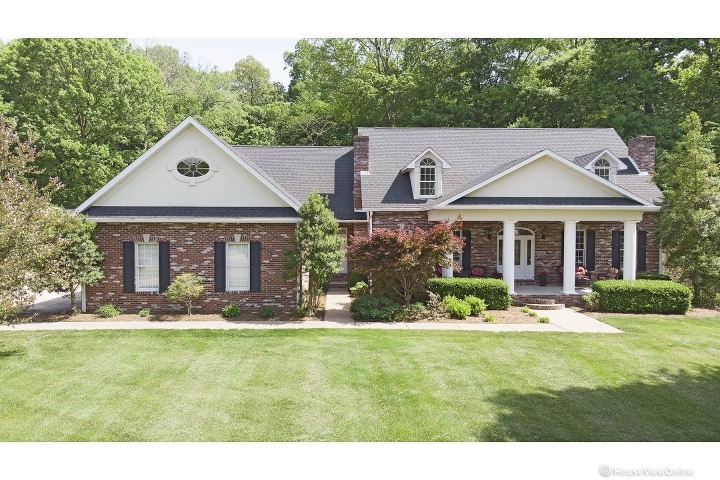 Stately & stunning, functional & fabulous... this 4 bedroom, 4 1/2 bath home should be at the very TOP of your list to see! The newly renovated, gourmet kitchen will knock your socks off! Beautiful custom cabinets, Cambria countertops, high-end luxury appliances, center island, custom cabinet/ drawer organizers, & butcher block built-in table- you will feel like you've stepped right into Southern Living magazine. With 5,119 finished square feet, the floor plan is both spacious & accommodating. The kitchen opens to the large family room with built-ins, both overlooking a backyard oasis- an in-ground pool for long summer days, & stone wood-burning outdoor fireplace for those chilly fall/winter nights. Retreat to the Master bedroom suite boasting a huge walk-in closet & ensuite bathroom, or cozy up in the mostly finished, remodeled basement with a kitchenette. New hardwood flooring, office, formal dining, centrally-located, beautiful neighborhood- set up a private showing Today! This private retreat was designed by John Boardman. Tucked away in the Dover neighborhood of tree lined streets and park like yards. The relaxed versatile floor plan spreads over 5300 sq. ft. The living and dining room flow together with floor to ceiling windows and its breath taking views of the lush landscaping. The chef's kitchen was recently updated with Wolf, Subzero and Bosch appliances. Room to prepare meals while mingling with friends and family. With four bedrooms, a designer master suite and your choice of multiple living areas this home will suite a growing family or a couple wanting to live in pampered style. If your dream is an in-ground pool this 1 acre lot has several locations. Take a look...you will fall in love. This lovely home was built in 1988 but completely remodeled with a large addition in 2001 & '02. Architecturally designed and professionally decorated for comfort and entertaining large or small groups. To see it is to love it! Two wings with family living is central to the design. Four fireplaces. Eleven Sky Lights, Viking appliances, hardwood flooring, a wine cellar and library are just a few of what awaits you. A commodious 2 story Great Room with dramatic vaulted ceilings and expansive windows provides ample room for entertaining. The salt water aquarium & Koi pond are unique features in this home. Being master gardeners, the yard is lush with pergolas, a Japanese garden, a meditation sanctuary and outdoor kitchen, along with a covered gazebo. A total of 7,160 sq. ft. of living your dream. Please contact your agent for an extensive list of amenities.